It's scary to think that almost every day there's a recall out for one type of pet food or another. The Pet Food Recalls of 2007 were particularly troublesome and brought to light the many brands that offshore their production to facilities in China that have insufficient safety controls. Since forewarned is forearmed, I wanted to share a quick and easy way that you can stay ahead of game and get notifications as quickly as they occur with Google Alerts. What you get are notifications in your email inbox with the latest pet food recall notifications from across the Internet. The first thing you'll need is a Google Mail account. If you have an account, sign-in. If you don't, get one. It's easy and free. Next, surf on over to Google Alerts. Once there, you'll be able to put in keywords to create an alert. 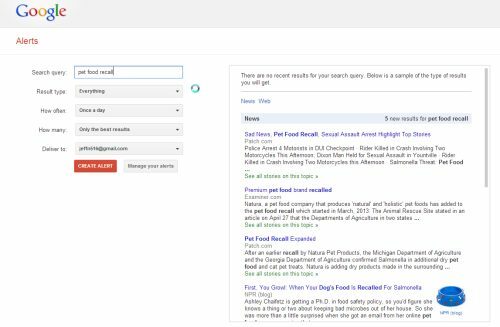 In the example, below you can see that I've used "pet food recall" (without the quotes) in the Search query field to accomplish this. I adjust the How often setting on some of the alerts I have set up, but I find either Once a day or Once a week, but be more than sufficient. If you change this to As-it-happens, you may find that the amount of email you get to be overwhelming. 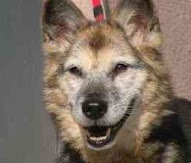 My own pet food recall alert is set to Once a day. That's it. The rest of the settings I leave as-is. I always leave the How many field as Only the best results, and that provides all the results I've ever needed. The purpose of keeping an eye on the products that are being recalled is not to create a panic, but to have the knowledge to make the best decision for your pet on a timely basis. Like any information, it depends upon individuals and companies reporting recalls, so it's not perfect, but it is a useful tool that you should consider. These quick pet food recall notifications allow me to put a quick eye on my email alerts in the morning and have piece of mind the rest of the day that the food (and treats) I'm feeding my dog haven't been recalled.